First time user of this site so I was a bit apprehensive. However, shipment was speedy and well within the promised time frame. Painting was well packaged in plastic wrap on each canvas and bubble wrapped, and all pieces were enclosed in heavy duty cardboard box. All were ready to hang and there were hanging fittings for all wall surfaces enclosed in package. We are so please with the painting, it really brightens the room and comments from friends have all been positive. Will definitely buy from this supplier again. 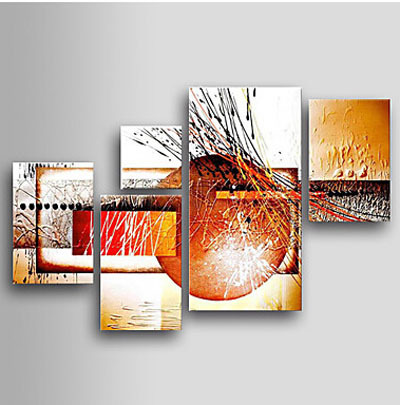 Actually would like another abstract in same colours for the adjoining wall.